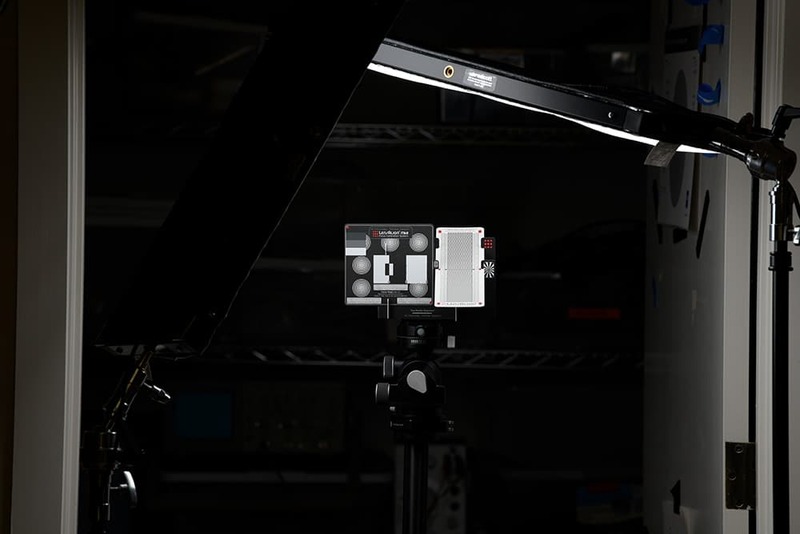 In this post, we saw that the Nikon 105 mm f/1.4 lens exhibited focus shift for which the D850’s phase-detection autofocus (PDAF) system couldn’t compensate. I know from testing the 105/1.4 that it has a lot of focus shift. The 105/1.4 can be thought of as a kind of specialist lens. Today, we’ll look at adjusting the autofocus compensation setting for a very common (and quite wonderful) lens: the Nikon AF-S Nikkor 70-200mm f/2.8E FL ED VR. Don’t you love all those obscure letters? The tool that I’ll use for analysis is FocusTune. 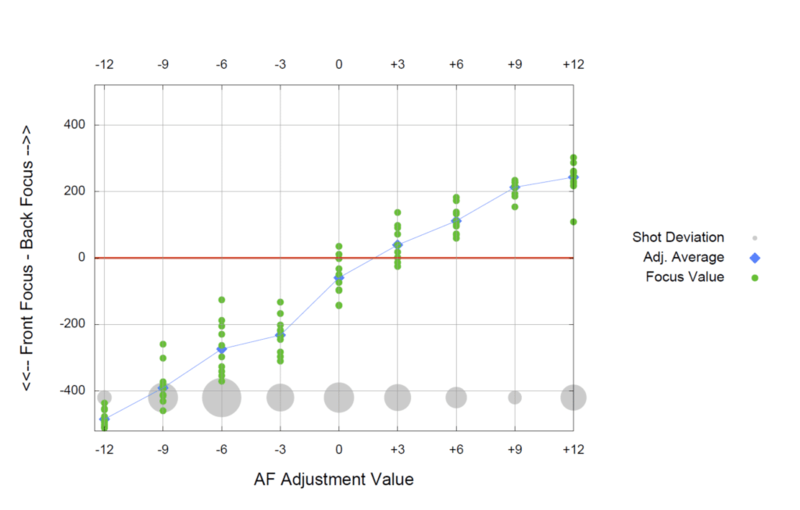 The horizontal axis is the autofocus compensation value entered into the camera for each set of data points. Where the camera focused for each data point is indicated by a green dot. The correct focusing plane is the red line. I don’t understand the vertical units, and I’m treating them as arbitrary. 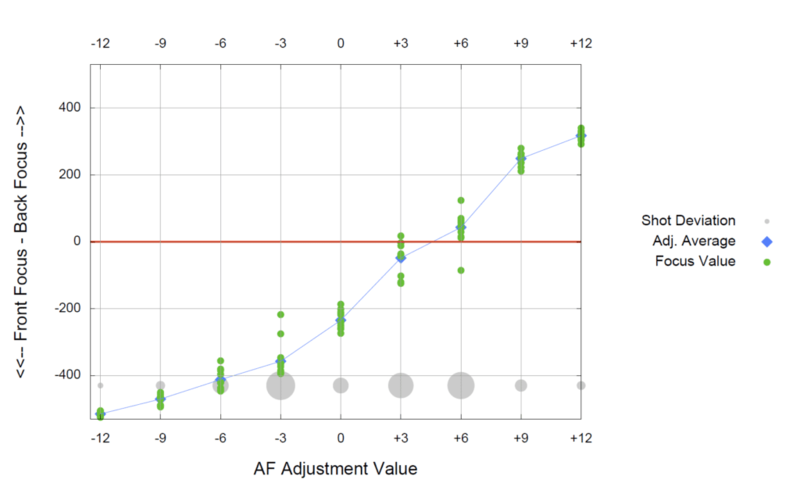 The gray circles are a visual indication of the standard deviation (sigma) of the samples at each AF tuning value. 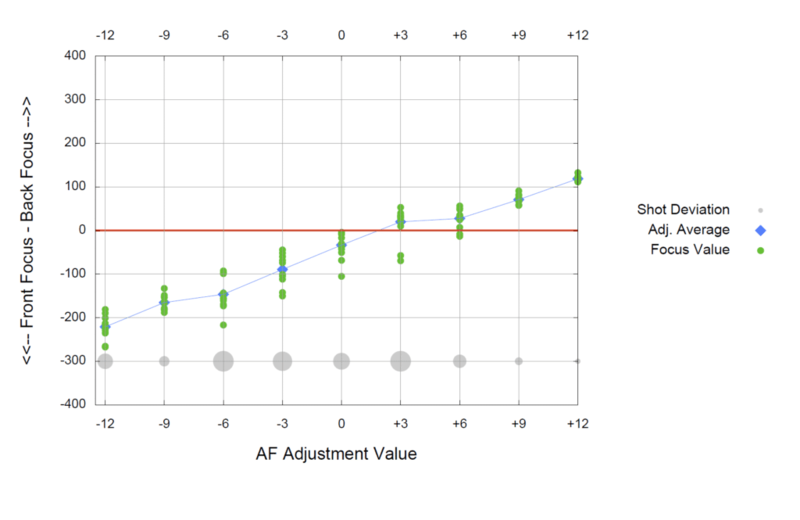 This shows that an AF compensation setting of +2 will work at both f-stops, and presumably everything in between. Is it going to be easy to tune this lens? Turns out it has a few curves to throw at us. I next set the focal length to 200 mm and made a pair of plots. Whoa! The wide open optimum AF trim value is about the same as at 105 mm, but the lens takes a -12 at f/8! 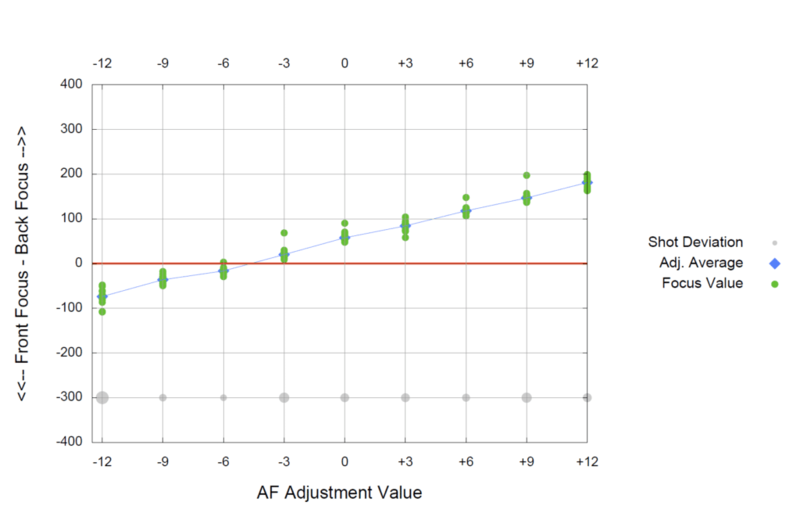 The +3 value that works for both apertures at 105mm and f/2.8 at 200 mm will be OK when the lens is wide open at 70 mm. But the right value for f/8 is about -5. 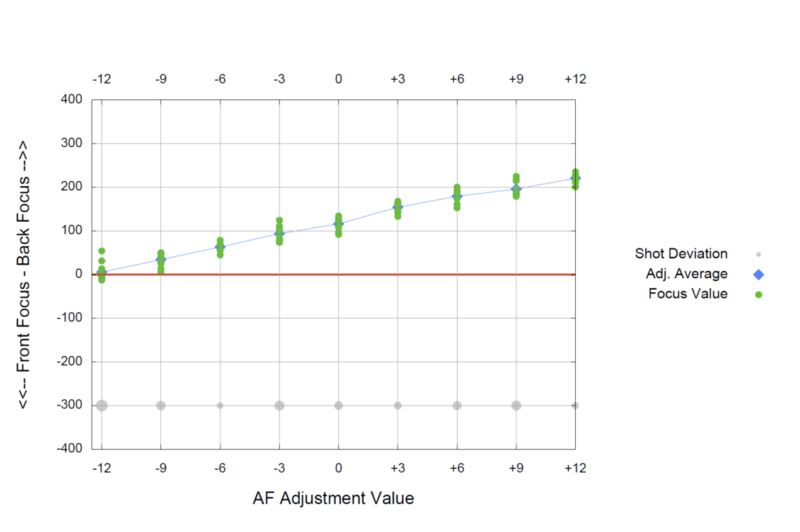 If we knew the units of the vertical axis, we might be able to tell if the depth of field will cover up focusing errors at f/8 at both ends of the zoom range if we set the compensation to +3. But I don’t know that, and the fact that the slope of the curve changes with f-stop tells me that it’s probably not focal plane distance difference. Reading these last few posts, I have to echo your earlier sentiment, Jim – my A7RII has spoiled me. I could never go back to DSLR land and deal with this nonsense again. These results are all over the place – even with brand new lenses. Judging by years of repressed experience, I dread to think what kind of charts we’d see with the 12MP D700/D3 era and older lenses. Will you be looking at Lloyd’s issue for LENR on the 850 ? Hope so – happy new year! I can, but I don’t use LENR on any camera except under very special circumstances, so it’s not at the top of my priority list. I just bought Reikan Focal and it is alright. But is FocusTune better? Does Focustune have automatic control of the d850 or do you have to do a lot of intervention and fooling around with the camera, like in Focal? I don’t remember much about FocusTune. I’m using my own software now. Sorry.